More news from Worth Avenue Yachts as Michael Mahan says he's joined Frank Grzeszczak at International Yacht Collection to list the 45.7m motor yacht Carpe Diem II. Built in 2002 by Trinity Yachts, she features a classic interior by Carol Williamson, and sleeps up to 10 guests in five cabins. Her two original Caterpillar 3512B engines give her a top speed of 20 knots and a cruising speed of 16 knots. 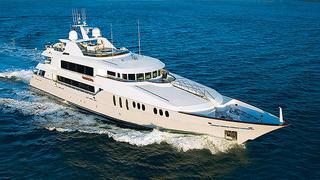 Lying in Miami Beach, Carpe Diem II is asking $15.5 million.